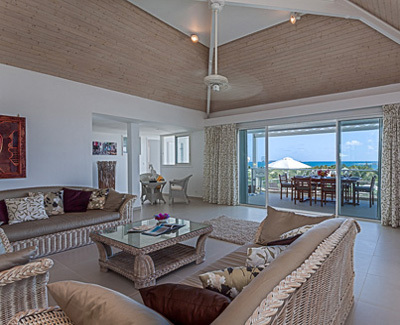 Ocean View has superb sunrise views over the ocean towards Tintamarre and St. Barth. Just recently completely remodeled, the villa is comprised of three, well appointed equal bedrooms with en-suite bathrooms and a spacious living area that opens out to a covered terrace dining area and large sun deck and private pool. The villa is fully air-conditioned and is conveniently located in the gated residential area of Orient Bay, and only a short walk from restaurants, shops and the famous 'St Tropez of the Caribbean', Orient Bay Beach with its plentiful beach bars, restaurants and water sports.